Water. Having grown up in eastern North Carolina, that words conjures up images of crashing waves, sand between the toes and hot summer days. As I have aged a touch and become a father, that word now signifies days spent lazily by the pool with floats and diving boards. When my kids started swim lessons, my wife and I didn't consider them an activity to participate in for fun. Instead, we saw them as a life lesson, as valuable as reading, writing and math. With the amount of water here in NC and my wife's love of the beach, swimming was never a choice, but more of a when. And so began my foray into the wonderful world of underwater photography. I doubt that many people could list 5 things more graceful than a swimmer doing their favorite stroke across a pool. In fact, if you watch carefully, that stroke is almost an extension of the being, looking like a natural movement to them. The amount of power required to run at full speed while seemingly gliding through the water is immeasurable, by me anyway. So I love to get in the water and create images showing that power. Robert swam in high school competitively and worked at Granite Falls during his down times. When we got hooked up for his senior swim session, I told him just to do what he does in the pool. We worked through each stroke as if it were practice, a nice leisurely pace, and as if it were a race, all out speed. His favorite stroke was the butterfly, so naturally, we put a little more emphasis on that one. You can feel his hands pulling through the water column with power, causing air bubbles to rush to the top of the water. You can see the beauty of the symmetry of his parody underwater, as his arms are at identical angles with hands cupped tightly, ensuring he is getting the most pull he can. You can sense his intensity as he pays no attention to me, but remains focused solely on the wall and the turn he has to make. To create such awesome pictures underwater, you have to overcome a couple obstacles. First, and likely the biggest, is the expense. This image was created with the same camera I use for weddings or other portraits, a Canon 5d Mark IV and coupled with a 24-70 lens. Neither camera nor lens is waterproof, so a waterproof housing is required. I prefer to ensure that my gear is safe, so I use a Aquatech housing to cover my camera and lens. I'll let you Google that and you'll see where the expense comes in. Third, you have to know how to swim and control your balance underwater. You don't make these images from the sidelines - you get in and under the water. Knowing how to swim is required as often you'll be in water slightly above your head. Add the weight of your gear and you need to be able to surface with an extra 10-15 pounds. The balance comes in understanding that to create this image, you must be lower than your swimmer. That is you have to sink. If I shoot this moment straight on, you'll never see his chest lines and lose the water's reflection. Lastly, you have to understand the timing and the important feature of the strokes. Take time to watch and understand before you randomly begin snapping away hoping to get lucky. You have to understand things as much as the swimmer does. 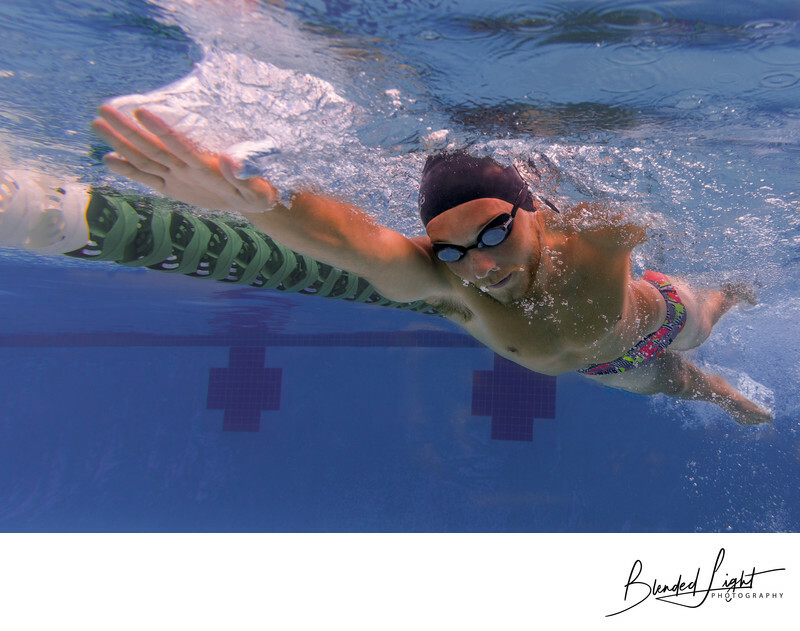 If you are a swimmer and want to incorporate some underwater images in your senior session, contact me. I am one of a handful of photographers, at max, in the Raleigh area capable of capturing these images and I would love to do the same for you! 1/1600; f/6.3; ISO 200; 24.0 mm.